Advances in Applied Mechanics draws together recent significant advances in various topics in applied mechanics. 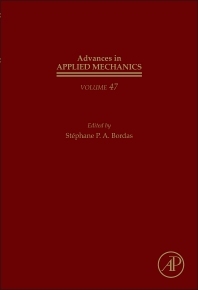 Published since 1948, Advances in Applied Mechanics aims to provide authoritative review articles on topics in the mechanical sciences, primarily of interest to scientists and engineers working in the various branches of mechanics, but also of interest to the many who use the results of investigations in mechanics in various application areas, such as aerospace, chemical, civil, environmental, mechanical and nuclear engineering. Born in Paris, France, in 1975, Stéphane joined in 1999 a joint graduate programme of the French Institute of Technology (Ecole Spéciale des Travaux Publics) and the American Northwestern University. In 2003, he graduated in Theoretical and Applied Mechanics with a Ph.D. from Northwestern University under the guidance of Professor Brian Moran. Between 2003 and 2006, he was at the Laboratory of Structural and Continuum Mechanics at the Swiss Federal Institute of Technology in Lausanne, Switzerland, working under the support of Professor Thomas Zimmermann. In 2006, he became permanent lecturer at Glasgow University’s Civil Engineering Department. free boundary problems and problems involving complex geometries, in particular moving boundaries : fracture and cutting mechanics, biofilms, tumours… This research direction requires, in particular, devising efficient numerical methods to treat spatially evolving discontinuities, singularities or boundary layers, e.g. enriched/extended finite element methods, meshless/meshfree methods, mixed methods ; this requires also to handle complex geometries, e.g. through generalised isogeometric analysis. ‘a posteriori’ discretisation and model error control, rationalisation of the computational expense : multi-scale homogenisation, algebraic model reduction (proper orthogonal and generalised decomposition) ; with special focus on non-reducible problems, e.g. cutting, fracture, front propagation. Stéphane’s keen interest is to actively participate in innovation, technological transfer as well as software tool generation. This has been done through a number of joint ventures with various industrial partners (Bosch GmbH, Cenaero, inuTech GmbH, Siemens-LMS, Soitec SA) and the release of open-source software, available on SourceForge (http://sourceforge.net/users/cmechanicsos). He has been collaborating with over 110 academic partners over the last 10 years.